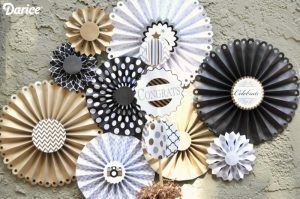 › Celebration › 10 Ideas for a Great Graduation Party Celebration! 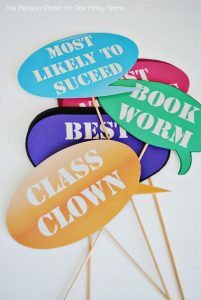 10 Ideas for a Great Graduation Party Celebration! It’s graduating time! Pull out the caps and gowns, the diplomas, and the fancy announcements. Hmm, maybe we’d better do more than tell everyone the good news. I know! Let’s celebrate with a graduation party! Do you have decorations? If not, check out the ideas below to perfect your graduation party. I’m always a fan of these …fans. Black and gold are typical colors for a graduation, or you can fill in with the graduating senior’s school colors. Or, think about the school colors of whatever college your graduate has been accepted to. Everyone knows that teenagers LOVE to be embarrassed. Heck, they’ve earned it. Good thing you parents have been saving up all those great bathtub shots and awkward school pictures. I’m thinking collage, scrapbook, or full-on wall of events. Just be sure and make it tasteful: match color scheme or be sure they all fit the theme of embarrassing. 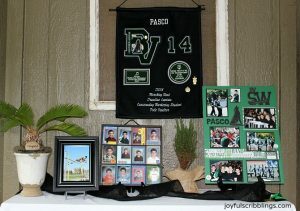 It’s perfect for a graduation party since it’s kind of a sendoff for your grad into adulthood. He or she doesn’t know it yet, but life is going to be a little challenging. Can’t we help a newbie out? 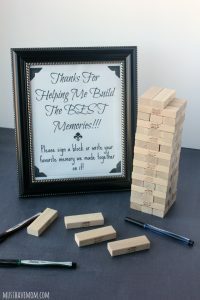 A clever way to gather and gift words of wisdom is by having each guest write a little something on a Jenga block. It’s advice and a game. 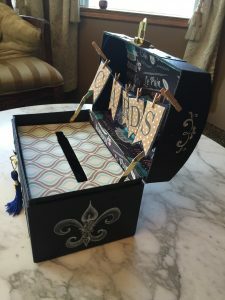 You can also just ask for favorite memories they have of the guest of honor. Get some great markers from Michael’s, and snag a Jenga game or two. What are you waiting for? 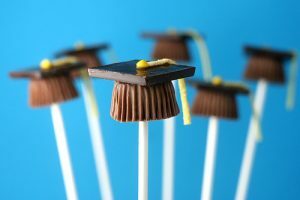 This is a perfectly sweet idea for a graduation party and it’ll be something your grad will hold onto forever. One of the best perks of graduating is free stuff from friends and family. Hey, I’m just being honest here. But we don’t really want to look like that’s all we care about, now do we? Hop over to an eclectic shop, or Goodwill, and snag a fancy-looking chest or suitcase. 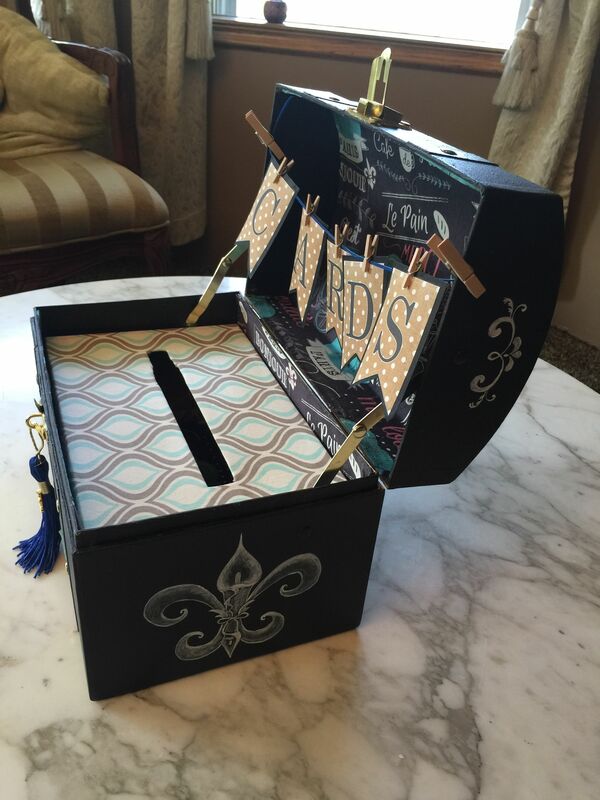 With a little ingenuity (an empty box of tissues, covered in paper), you’ll have the craftiest gift card box this side of the internet. If you’re hosting a graduation party (or a party of any kind, really), you’re going to need food. If you’re hosting one that involves teeangers, you’re going to need a lot of food. Fortunately, we’re not too concerned with super healthy items. I’m thinking pizza bites, pizza rolls, and maybe pizza pizza. 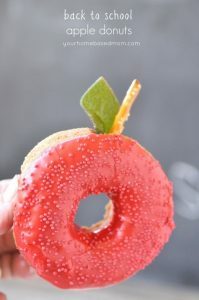 For dessert, I’m sure your darling young adult will allow a little cutesy theme-ing in the form of this “apple” donut. It’s really a cake donut, frosted in red, with a pretzel stem and green fruit leather leaf. Now, you may be thinking that I haven’t given you many graduation party ideas for high school. Were you thinking, say, a cap and tassel on a stick? You know you were. These candy cup caps are a cinch, too. You can form your own chocolate pieces; or use a miniature Reese’s peanut butter cup, Godiva chocolate square, and melting chocolate (for glue). The stick is a stick, and the tassel is a strip of Airheads Extremes Rainbow Berry Sweetly Sour Belts. You asked for it, so here’s another graduation-themed idea. 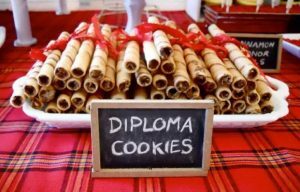 They’re diploma cookies! Okay -they’re really a tin of Pirouette cookies with a ribbon wrapped around each. Who’s going to nit-pick? They’re cookies. These are perfect for your graduation party. Cookies aren’t the only ones dressing up as diplomas. I’m going to call these Diploma Dogs. 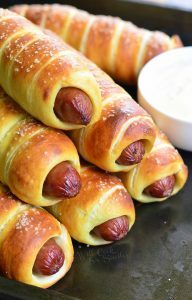 If it makes more sense, you can call them pretzel-wrapped hot dogs. I’m good; just hand me one. Kids these days (and their parents) are all about the selfie thing. As such, I’ve seen a rise in popularity of photo props. You wouldn’t want to be the lame parent who didn’t anticipate this trend, now would you? Print some out, or buy them. They’re an easy party accessory, and kids of all ages really dig ’em. 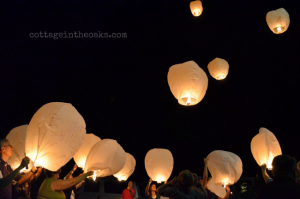 I love this final idea, involving floating lanterns. Graduation is a time to move on, grow up, and think about the future. Even those not at this milestone have future dreams and goals. Each guest, therefore, is going to write his or her dream or goal on a lantern. Once lit, they will all be released to Fate and the sky.